Houston is coming off a 103-win season and the Astros have won the AL West in two consecutive seasons. Oakland and Seattle were in the playoff hunt last season. Los Angeles has the best player in the galaxy, while Texas seems destined for a second consecutive 90 loss campaign. Can anyone catch Houston? Or will the Astros be crowned kings of the Wild West? 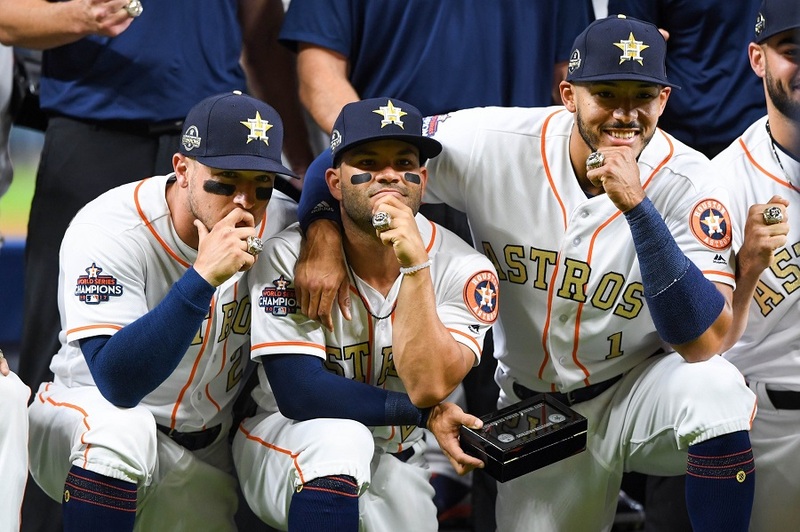 The Astros won the World Series two years ago and are coming off a franchise record 103 wins. Houston’s lineup and top starting pitchers are among the league’s best. This is just one of the many reasons the club will be at the top of the AL for the third consecutive year. It’s crazy to think how deep this lineup is with the likes of Carlos Correa, George Springer, Alex Bregman, and Jose Altuve. Gone from the rotation are Charlie Morton (free agent) and Lance McCullers Jr. (Tommy John surgery). Justin Verlander and Gerrit Cole are a strong one-two punch and the team added Wade Miley to be the club’s number three pitcher. While the club might not get to 100 wins, it’s Houston’s division to lose. The As won 97 games last season and no, that’s not a typo. Oakland rode a strong offense built around a lot of power to a surprising playoff berth. Matt Chapman, Khris Davis, Matt Olson and Stephen Piscotty are all capable of hitting 25+ home runs. Former top prospect Jurickson Profar is going to try and find himself by the Bay. Former Twin Robbie Grossman could also play a role in the outfield. Last season, Oakland’s biggest weakness was their rotation. The club is scheduled to start the year with Mike Fiers, Marco Estrada, Brett Anderson, and Frankie Montas. That’s not exactly a murder’s row of a rotation. Can the bullpen bail them out for the second consecutive year? Oakland will take a step back this season but could contend for the second Wild Card spot. Mike Trout just got paid and he is well worth the price of admission. Unfortunately for Angels fans, there isn’t much else to get excited about in LA. Shohei Ohtani certainly brought some excitement last season but he had Tommy John surgery so his two-way playing will be limited to DH duties. Albert Pujols isn’t getting any younger, so Justin Bour was brought in for first base. A few new acquisitions could help the club. Jonathan Lucroy could add something behind the plate, but he’s been trending in the wrong direction offensively. Cody Allen add some stability to the late-innings. Matt Harvey and Trevor Cahill could surprise at the back-end of the rotation. New manager Brad Ausmus could guide LA to a wild card but don’t count on it. The list of players departed from Seattle’s roster could form the core of a strong roster. Robinson Cano, James Paxton, Nelson Cruz, Edwin Diaz, Jean Segura, and Mike Zunino are all gone. Seattle is in rebuild mode and the team’s above them on this preview should be able to beat up on what’s left of the Mariners. Edwin Encarnacion joins the club, but it was only to help trade away players like Carlos Santana and Jean Segura. Jay Bruce, Mitch Haniger, and Dee Gordon are still in the in the lineup. Kyle Seager will start the year on the DL. Felix Hernandez is only 32, but he has a lot of miles on his arm and has struggled recently. Seattle won’t be focused on winning this year. Eyes are on the future. There’s not much in Texas except a whole lot of rebuilding. Joey Gallo can clobber the ball. Elvis Andrus and Rougned Odor form a decent middle infield. Their top prospects don’t figure to get much time in Arlington in 2019. This leaves players like Shin-Soo Choo, Asdrubal Cabrera, and Hunter Pence to fill-in until other younger players are ready to take over. Former Twin Lance Lynn is scheduled to be the number two starter. Let that sink in for a minute. The good news is there should be plenty of long balls for fans to catch if they sit through the Texas heat. Also, the club should end up with a top draft pick next summer. What do you think about the AL West? Can anyone catch Houston? Leave a COMMENT and start the discussion. I doubt anyone will catch Houston, its possible but unlikely. Not only are they one of the elite teams in baseball, but they have 6 of the top 100 prospects in AA or higher in they need support during the year. That's a good model for building a team. Seattle could have a decent offense with exciting young guys like Mallex Smith, Domingo Santana, and Tim Beckham joining Encarnacion, Dee Gordon, Mitch Haniger and eventually Kyle Seager.Ryon Healy is young too but has been good 2 of his 3 seasons.A lot of ups and downs for the young guys they have, kind of like the Twins are hoping 2-3 guys put it all together. Their pitching is the question with Gonzalez, Kikuchi, Hernandez and Leake.They would probably need Justice Sheffield to arrive to have any success here. I think people are more down on them than they deserve.A couple young guys take the final step forward and .500 is possible.If there isn't a clear 2nd wildcard and 85 wins gets it like in 2017 then 77-81 Wins wouldn't look too bad.Underdogs for sure but I don't believe they "tanked" as bad as everyone else seems to believe.I see them as pretty close to the Angels. Also gone is some guy named Dallas, unless they re-sign him. They lost 37 wins and 500 IP from their 2018 rotation and added 5 wins and 80-2/3 IP.Hard to replace all 3. How Soon Could Royce Lewis Call Target Field Home?